At The Broadway we make fresh, rich, super premium ice cream all year, right here on the premises. Our ice cream doesn’t sit around, we don’t pump it full of air and we don’t skimp on the butter fat content. And you can taste The Broadway difference: smooth, creamy, luscious and bursting with flavor. 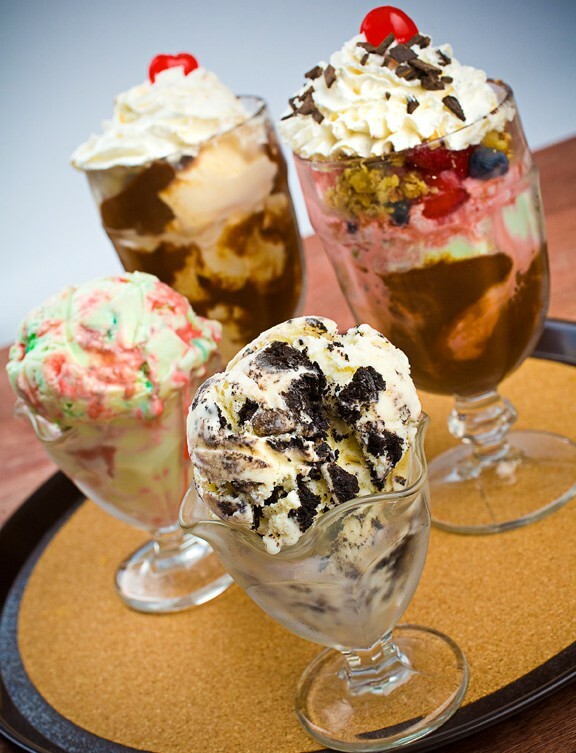 Come on in for a dish, a cone, a sundae, a frappe, a root beer float or our latest soda fountain creation. We can also hand pack a pint or half gallon for you to enjoy at home. We make Baked Alaska and Spumoni. Ask for a slice today. Below is a list of some of our popular flavors. If you have an idea for our next favorite flavor please let us know. We are always excited to crowdsource ideas for any custom flavors that you think our patrons might enjoy. Check out the updates section on our Homepage for new and seasonal flavors like Pumpkin and Eggnog as they arrive. Your favorite might be next! We also cater Ice Cream Socials. Who doesn’t love a make your own sundae buffet bar? We provide all the fixings: Ice cream, hot fudge, strawberries, whipped cream, nuts and a variety of other popular candy and cookie toppings like M&Ms, chopped Oreos and chocolate chips. Don’t forget about the cherry on top!!! We also provide all the serving utensils and paper goods for your convenience. Pickup or delivery available.